Aquascutum have designed a particularly hijab-friendly collection for Spring 2010. 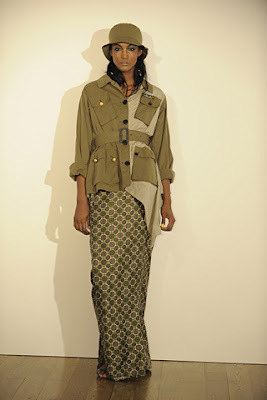 Military khakis, trenches over printed maxis and full-length skirts featured prominently. The outfits speak for themselves, but what do you think of them? Is this something you see yourself wearing? but i dont think i will wear it in Malaysia. since its really hot here. Very Cute. Is this a British designer? I'm loving the jackets especially the second one down from the left - gorgeous! i LOVE the yellow dress. I would wear it in a heartbeat. LOVE IT...that maxi skirt is it sateen?lycra? minus that trench coat, i believe that i can wear something similar or that color combo. Some of them i'd wear. Some of them just aren't me. i can wear all of them. Also I want to wear all of them. 1st and 2nd, 4th and 6th...lovely! I always thought longer blazers/coats over maxi skirts or dresses look kind of frumpy, but there's nothing frumpy about these styles! I would wear them anyday. Good for inspiration. This is almost like a collection of my African wears made b y my tailor- even the necks. I wear them for weddings :-p and of course I love them! waw...i really really like these outfit..very nice n beauty for look. So refined and traditional. Fantastic showerproof fabrics.